Even the most preliminary studies of the Mayans will tell you they were a very remarkable people. Their building block-styled pyramids date back at least as late as those of ancient Egypt, they were advanced in mathematics, had a more sophisticated handle on astronomy than nineteenth-century European scientists, and were the first indigenous tribe on the American Continent to have a written language. Outside of that, many people don’t know a whole lot about the Mayan civilization. After this article, that all should change. Archaeological digs in recent years tell a somewhat different story. The early Ma civilization did in fact practice human sacrifice, but it was considered a favor. The Mayans believed that paradise was achieved by passing first through a terrible underworld, then navigating thirteen more levels before arriving at eternal bliss. The journey was so difficult that not all souls could make it to the final goal. The only ones who could bypass this epic quest were sacrificial victims, women who died in childbirth, victims of war, suicides, and those who died while playing ball. To be chosen as a sacrifice was an honor, as you would then be a messenger to the gods. Astronomers and mathematicians used the calendars to figure out when sacrifices should be made and who was the best messenger. For this reason, sacrificing outside the tribe would have been rare. Scientists and historians have been debating for a long time as to just how technically advanced the Mayans really were. They lacked two things that typically marked the development of a civilization: wheels and metal tools. Their architecture included archways and hydraulic irrigation systems, concepts that involve the measurement of curves and their leverage. They also knew how to mix hydraulic cement. As they had no hauling animals, inventing a cart may not have seemed important. Or they may have made some rubber buggies we don’t know about, but even without wheels, their technology was amazing. Instead of metal tools, they used stone. Jade and jadeite, a family member of jade, have a hardness that surpasses a steel knife. These carefully honed tools were used for carving sculptures, stone cutting, wood cutting, chiseling, gouging, chopping and hoeing. Not to be left out, the medical profession also boasted exemplary tools. Shaped from volcanic glass, the scalpers and cutting tools made for surgeons performing delicate surgeries continue to be some of the sharpest in the world. The stone tools of the Mayans were, in many ways, superior to the metal tools more commonly associated with advanced technology. “Keep your fancy wheel, we’ve got better toys,” is essentially how they felt. Trying to unravel all the mysteries concerning the Mayans is frustrating. Although the larger body of science favors the settlement of indigenous tribes into America to a land bridge crossing between Russia and Alaska during the last ice age, there are those who stubbornly insist the Mayans crossed the waters from Asia and Africa. Using the Codex documents as partial support, they point to the underwater cities as evidence that the Mayans were once seafaring people. Another, somewhat baffling occurrence was the co-existence of the Olmec culture during a time period when the Mayans began emerging as a civilization. Dual civilizations are not abnormal, and it’s possible the Mayans incorporated much from the Olmec, including chocolate beverages, ball playing, sculpturing and reverence for animal gods. What is striking is there is no indication of where the Olmec came from or how they disappeared. What they left behind were the first Mesoamerican pyramids, and some colossal stone heads. While the sheer magnitude of size led some to believe the Olmec must have been giants, it’s the realistic features that have started the overseas argument. The Olmec are depicted with heavy-lidded eyes, short, broad noses, and full lips. Advocates of Biblical-era migration claim this is clearly an indication that the Olmec arrived from Africa. The Olmec seemed suddenly to spring up around BCE 1,500 and busied themselves for thirteen hundred years before taking the curtain bow. Some of the earliest Mayan remains date back over seven thousand years. If they indeed migrated from Asia, they were doing it long before Moses parted the Red Sea. But you know how it goes — you talk to one burning bush, and suddenly everyone only cares about you. 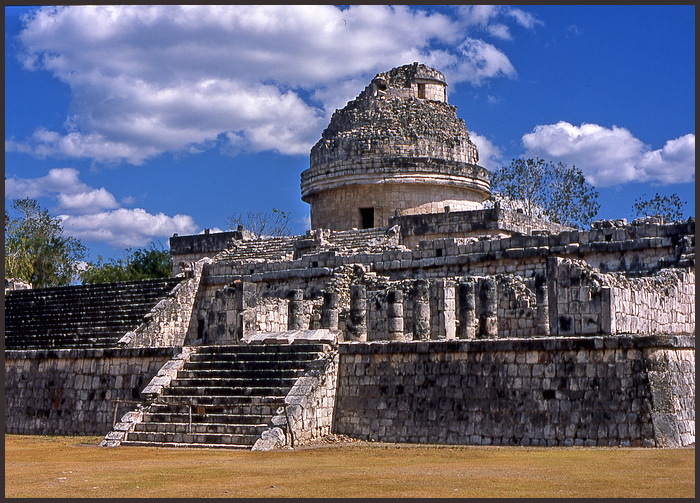 El Caracol is best known as “the observatory.” The 48-foot tower was built with numerous windows, allowing for observation of the equinoxes and summer solstice. Its alignment appears to favor the orbit of Venus. The glowing planet was of great significance to the Mayans, and it is believed the Tzolkin calendar, which has a rotational sequence of days and months parallel to Venus’ orbit, depended on it for determining events, celebrations, planting crops and war preparations. El Corocol is out of line with the other buildings constructed within the ancient city, but in direct alignment with Venus’ most northern position in the sky. So yes, it’s likely they thought about the stars, Gods, and the future as much as we all do. Probably even moreso, since they didn’t have Facebook and PlayStation to distract them. A favorite conspiracy theory among alien discovery groups is that aliens have visited us before and left advanced knowledge with its ancient people. Leading the charge in the late 1960’s was Erich von Daniken, a high-school drop-out from Switzerland, who made millions of dollars writing books about spacemen who manipulated humanity in one way or other, in order to elevate it from its animal base instincts to the loftier realm of consciousness. It’s a curious fact that the fondness for pyramids became an architectural fashion statement at the same time the Egyptians decided to upgrade their living standards, and scientists are a little lost for an explanation. They are also a little lost to explain why some landscape designs, such as the Nazca markings in Peru, are so large that they can only be appreciated from an aerial view. Daniken explained that this was because the ancient Mayans had flying machines and not only were they buzzing all over earth, those busy aliens had even given them the technology for space flight. His supporting evidence are drawings on the pyramids, which do look suspiciously like men in bubble helmets floating around, their feet kicking off the ground and an oxygen tube dangling above them. Of course, Daniken didn’t ask the Mayans what the different symbols meant. Their elaborate art uses earthly objects to represent such abstracts as “sky,” “descent,” and “appetite”, among other intangible things. 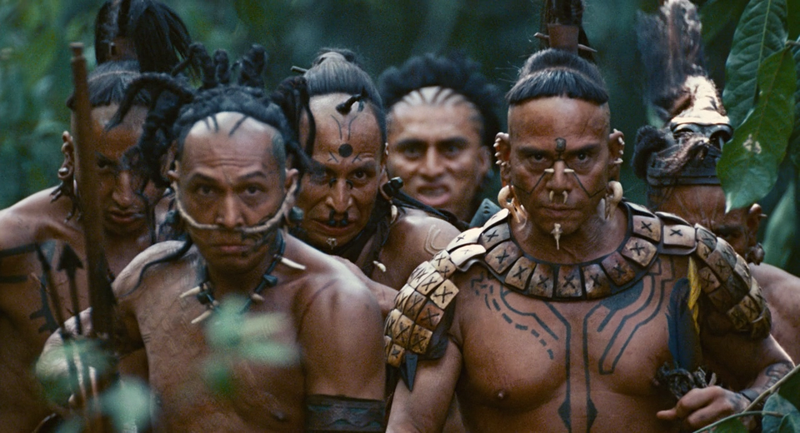 When Mel Gibson produced the movie, Apocalypto, he presented audiences with a titillating glimpse of a savage people dressed in colorful feathers, hunting ferocious wild game and clubbing each other to death. He assured us that these were the Mayans the Spaniards first encountered. Gibson may have had an artistic eye for producing exciting scenes and glossy scenery, such as the steamy rain-forest background, awesome pyramids, and genuine wild pigs running through the brush, but he sadly neglected to take any history lessons. Gibson’s barbaric Mayans sold women into slavery and used captive males as human sacrifices. There is no proof that the actual Mayans practiced slavery or even took captives, except in time of war. Gibson’s poor, innocent villagers from the hinterlands had never heard of the great city they were sent to for Mayan decadent civil service. During the period of Mayan civilization, all villagers were connected closely to one of the pyramids. They practiced a governance of city states, with each state retaining its anonymity. Gibson did get one fact right though: there were Mayans in Mexico when the Spanish conquistadors arrived. However, by then, the Mayans had no interest in building cities or making war. The first major contact was with the Aztecs, a rapidly rising civilization. Other than that though, Gibson’s historical accuracy here is about as good as when he made Braveheart, which is to say, not at all. Because of the grandeur of their past, Mayans are shrouded with the same sense of mystery and romanticism as the ancient Egyptians. Consequently, it can be difficult to sort out Mayan history accurately. It doesn’t help that most of the Mayan written history was destroyed by superstitious Spanish conquistadors who related the strange symbols to witchcraft. Only three documents survive the purge of Mayan literacy: the Madrid, Dresden and Paris Codices, named for the cities in which they had been relocated. In the laborious process of translating one of the codex scripts, historians fell upon a description of ancient cities that had fallen by earthquake, flood, and fire. These cities were not located on the mainland of North America, but vaguely described in areas of the ocean. One interpretation of the passages was that the Mayans originated in a region now covered with water, making them the heirs of Atlantis. While this story seems like folklore to modern minds, scientists have recently discovered what they believe to be the underwater remains of ancient Mayan cities. What is left to be determined is their age and the cause of whatever cataclysm placed them under the ocean. Hey, maybe Kevin Costner’s Waterworld, while terribly acted, wasn’t far from the truth after all. An Aztec calendar, which was an adaptation of the Mayan calendar. It consisted of a 365-day agricultural calendar, as well as a 260-day sacred calendar. Our society tends to mark a progression of years, using a significant event as the measuring point. For Christians, the markers are BC and AD, while much of the world uses the term “Common Era” to measure time by the same event. This creates a handy reference for pinpointing historical dates and recording births and deaths, but it also gives us a sense of lineal time, of beginnings and endings. The Mayans used three calendars, all of which worked extensively in groups of twenty. The civil calendar, or the Haab, had eighteen months of twenty days each, for a total of 360 days for each cycle. The Tzolkin was used primarily for ceremonial purposes. This calendar contained 20 months of 13 days each for 260 days in each finished cycle. Combined, they helped make up the complicated long calendar that tracks both planetary movement and the movement of the constellations. There was no beginning or end in the entirely circular structure of Mayan thought, and there was no year-end date, only the rhythm of the planetary cycles. Although Einstein was applauded for proving that time is relative, the Mayans knew it all along. One thing does remain undisputed; like all sports-minded Americans, the Mayans liked to play ball. Long before it occurred to our European ancestors to wrap some leather into a tight wad and chase it around, the Mayans had established a ball court, and their very own rugged game. Called ?llamaliztli, it appears to have been a brutal combination of football, basketball, and soccer. Their sporting gear consisted of helmets, kneepads and arm braces. The object was to use shoulders, legs, hips, or feet to drop a rubber ball into a hoop, which was sometimes fastened higher than twenty feet off the ground. The penalty for losing? You were sacrificed to the Heavens. Though as we mentioned earlier, sacrifice was an easy route to eternal salvation, so maybe the losers were actually the winners. When you begin boning up on your Mayan history, one of the first things you’ll read is how the Mayan people “disappeared.” The feeling you get is that what had once consisted of millions of people, by same strange quirk of history, suddenly died off. Actually, modern-day Mayans number about six million people in total, making them the largest indigenous tribe in North America. It wasn’t so much that they had perished as that for some reason, they felt compelled to abandon their great cities. Because so much of early Mayan history has been lost, it’s not really known why they abruptly ceased to build massive architectural works, hold ceremonies and conventions within their city centers, and develop institutes of higher education. Environmental factors, such as crash-and-burn strip farming and extensive drought have taken the blame, as well as speculations of over-population, warfare and famine. All that is truly known is that by CE 1524, the Mayans had become Back to Earth people who preferred small farming communities, and who abandoned their cities to the next great empires, like the Toltecs and the Aztecs. So why not go chat with a Mayan, buy them lunch, and ask some questions, rather than assuming the aliens took them all away centuries ago? Thanks for noticing. Finding a Mayan calendar proved to be impossible. I added a caption explaining why the Aztec calendar is used instead.